This afternoon from the Farmers Market in downtown San Antonio, Texas, WBA Welterweight Champion Adrien “The Problem” Broner and former IBF Junior Welterweight Champion Marcos “El Chino” Maidana participated in the official preliminary weigh-in event and posed for the capacity filled venue of media members and fight fans. On the eve of the highly anticipated main event of the evening, the defending champ seemed jovial and relaxed as he stepped onto the commission scale. Sporting a pair of shades, the reigning title holder began shadow boxing after he weighed in at a healthy 144.4 pounds. When Maidana stepped onto the scale, “The Problem” began talking to the Spanish speaking Argentine fighter. 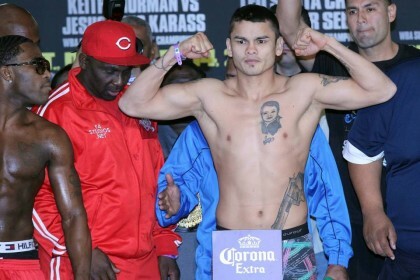 Seemingly unphased by the inaudible banter, “El Chino” Maidana weighed in at approximately 146.2 pounds. Both men appeared to be full of energy and didn’t show any signs of dehydration. After both men weighed in under the division limit of 147 pounds, the two competing fighters participated in the ceremonial face-off for the crowd of supporters and media members. The champ once again began speaking to the title challenger, which resulted in a hard shove instigated by Marcos Maidana. The brief altercation was quickly separated by current IBF Light Heavyweight Champion and future Hall of Famer Bernard Hopkins, who seemed prepared to intercede between any kind of disturbance on stage. After the media event, the hard punching Argentine had much to say about his opponent. When asked if he was intentionally trying to provoke the former 140 pound champion, the incumbent title holder was very candid.